Portable Power Station - AlphaNet Technology Ltd. The Pocket Power Station is ideal for any camping, caravan or expedition usage, where it can be charged by sunlight during the day in conjunction with a solar panel and used to run devices in the evening. It is also useful on marine vessels to power devices such as lights, RPVs (from the surface) and communications. It is an ideal addition to the equipment provided to relief agencies that may send teams into remote regions or where earthquakes have rendered the local power systems in-operative. Search & rescue teams would also benefit from the extended power supply to their lighting, thermal imaging or other life-detection systems. 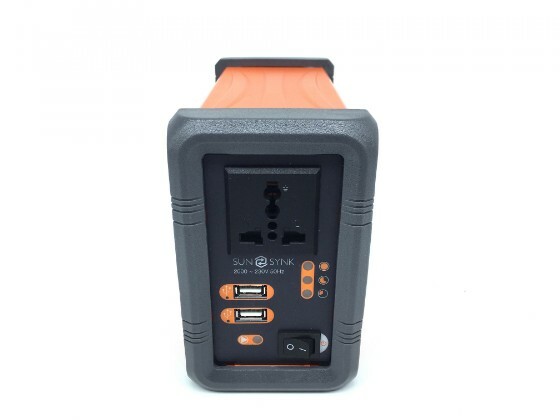 In relation to expedition use, the Power Bank would be beneficial to geographical expeditions, field film-editing systems, back-up power for campsites, field lighting and computer systems. Safari organisations and other leisure-focused organisations that work in remote areas in Africa or Asia would also benefit from this piece of equipment. 2 x Charging ports plus DC jack. Can be charged by solar power. Switch to start unit or switch off when charging. Unit can also cut in to provide power during power outages. 2 x UPS ports to connect to devices such as computers. One 13 amp port for a normal plug to connect to existing appliances using a 3-pin plug. Can operate in temperatures between -20 to +30 degrees Celsius. Can remove lithium batteries for flight travel regulations. US / Euro voltage compatible.